Harriet Hosmer, Watertown, Massachusetts 1830 – 1908, Rome, Italy. Will o’ the Wisp, ca. 1856. Marble, 30 ½ x 19 ½ by 13 ½ cm. Gift of Julia Bryant (Mrs. Charles J.) Paine, 1876. Will o’ the Wisp is one of a series of whimsical sculptures created by the American artist Harriet Hosmer beginning in 1855. 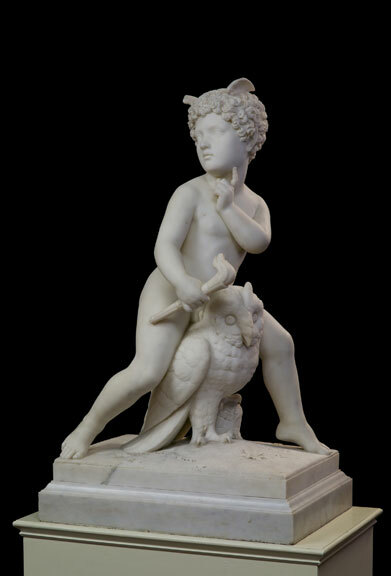 This sculpture and several other similar conceptions in marble – Puck being the best known of the group – were designed by Hosmer on a scale compatible with the typical upper-middle-class parlors of contemporary English and American patrons. The sculptures’ literary or mythological themes, playful attitudes, fine craftsmanship, and white marble material were carefully calculated to satisfy these patrons; indeed, the Athenæum’s version of Hosmer’s Will o’ the Wisp sat for a time in the Boston parlor of just such a patron. The sculpture thereforetypifies the taste of the period, but an atypical coincidence of the gender of both its creator and its original owners gives this object a special place in the history of American neoclassical sculpture. By the time Harriet Hosmer conceived Will o’ the Wisp, she was on her way to becoming one of the best-known and most successful professional women of her day. Part of her success was due to her father, Dr. Hiram Hosmer, who, deeply affected by the early death of his wife and three other children from tuberculosis, was determined to give his surviving child a level of freedom unusual for women at the time. Dr. Hosmer apparently fully supported Harriet’s early decision to be a sculptor. He built a studio for her near their home in Watertown, and allowed her to study the rudiments of drawing and modeling with sculptor Peter Stephenson in Boston. Barred by her gender from studying anatomy at any of the appropriate institutions in the northeast, Hosmer was sent by her father to St. Louis, Missouri, where she could pursue that needed training while residing with family friends. By the time she returned to Massachusetts in 1851, the young woman had received a number of commissions for ideal works and portrait busts. Her obvious talents and vibrant personality earned her the support of friends such as the writer Lydia Maria Child and the actress Charlotte Cushman; on their advice, Hosmer left for Italy in 1852. There, she was admitted as a pupil of the well-known British sculptor John Gibson, and became one of the most popular members of the Anglo-American community in Rome. At first, Hosmer’s advancement in the highly competitive atmosphere of the Italian capital was slow. But in 1855 she made a breakthrough with a sculpture that would prove to be her most lucrative: a depiction of Puck, the forest creature from Shakespeare’s A Midsummer Night’s Dream. In fact, Hosmer’s Puck became so popular that it eventually was replicated at least thirty times, with several replicas commissioned by visiting royalty such as Albert Edward, England’s Prince of Wales (later King Edward VII), who visited Hosmer’s studio in Rome and ordered a Puck for his rooms at Oxford. In 1858, clearly hoping to take advantage of Puck’s popularity, Hosmer created a pendant for it in the form of Will o’ the Wisp. Hosmer’s initial conception of the legendary swamp dweller (Chrysler Museum, Norfolk, Virginia), which was seen traditionally as a symbol of elusive hope with a personality that combined good and evil, was not as successful as Puck, possibly because of its less than specific theme and its somewhat awkward composition. Presumably realizing that Will o’ the Wisp had aesthetic problems, Hosmer adjusted the design and produced at least two variants: The Boston Athenæum’s appears to be the second of these,while the final version, modeled after 1864, is now in the collection of the Chrysler Museum. None of the three Will o’ the Wisps has the charm of Puck and, in fact, the final version is even somewhat menacing. The lack of popularity of these pieces is proven by the fact that neither the Athenæum version nor the final version, now at Norfolk, is known to have been replicated. The Athenæum’s Will-o’-the-Wisp made its first public appearance when it was lent by its owner, Julia Bryant (1847-1901), to the institution’s annual exhibitions of 1866 and 1867. Julia was a daughter of John Bryant, Jr., and Mary Ann Lee and the granddaughter of Harriet F. (Sawyer) Lee. The elder Mrs. Lee was something of an art historian and an author, and it was from her that Julia Bryant inherited not only Hosmer’s Will o’ the Wisp but also several other major sculptures said to be by Horatio Greenough (including Child with Grapes),Peter Stephenson (Indian Bride), and Antonio Canova (Venus of the Bath). Julia Bryant lent all of these sculptures, along with Will o’ the Wisp, to the Athenæum for exhibitions in 1866 and 1867. Julia Bryant’s father died the year of her birth and her mother died in 1862, leaving her as Harriet Lee’s closest relative and, when Harriet died three years later, her major heir. The following year – 1866 – Julia married Charles Jackson Paine (1833-1916) of Boston. Both Charles Paine and his wife were respected citizens of Boston and nearby Weston, Massachusetts, where they spent their later years. They had a small collection of art, which included not only the sculptures identified above but also a number of paintings, some of which Julia had inherited from her parents and grandmother. By the time of her marriage, for example, Julia owned Washington Allston’s painting The Young Troubadour (1832, unlocated), which she lent to the Athenæum’s annual exhibition in 1866, as well as paintings by Alfred T. Bricher, Edwin White, and Gilbert Stuart. Julia Bryant Paine’s loan of works of art to the exhibitions of the Boston Athenæum and her eventual gift of Hosmer’s sculpture to the institution seemed most appropriate. She had connections to the institution on both her paternal and maternal sides and, again thanks to her grandmother, she was a Proprietor of the Library. In addition, by 1876, when she made the gift of the sculpture to the Athenæum, its neoclassical style was considered quite old-fashioned, having quickly lost favor after the Civil War. Will o’ the Wisp and kindred sculptures no longer fit into the parlors of the wealthy and culturally astute. David B. Dearinger from, Stanley Ellis Cushing and David B. Dearinger, eds., Acquired Tastes: 200 Years of Collecting for the Boston Athenæum (2006): 287-290. Copyright © The Boston Athenæum. H. Nicholas B. Clark has recently made this point with a 1916 photograph of the parlor of the Gardner Brewer house in Boston. See Clark’s, A Marble Quarry: The James H. Ricau Collection of Sculpture at the Chrysler Museum of Art (New York: Hudson Hills Press, 1997), 217-218. For Hosmer’s life, see Harriet Hosmer, Letters and Memories, ed. Cornelia Carr (New York: Moffat, Yard and Company, 1912) and Dolly Sherwood, Harriet Hosmer, American Sculptor, 1830-1908 (Columbia and London: University of Missouri Press, 1991). “Miss Hosmer’s Studio at Rome,” Harper’s Weekly 3 (May 7, 1859): 293-294. Examples of Puck are at the Smithsonian American Art Museum, Washington, D.C., the Wadsworth Athenæum, Hartford, Connecticut, the Chrysler Museum, Norfolk, Virginia, and elsewhere. At some point in its history, probably after it arrived at the Athenæum, the title of the sculpture became confused. By the mid-twentieth century, for no apparent reason other than expediency, it had been given the title Puck with an Owl. Nicholas B. Clark has recently made a plausible case for the sculpture’s being the third version of Hosmer’s Will o’ the Wisp. See his analysis of the problem in Clark, 225. Perkins and Gavin, 189; for Harriet Lee, (see cat. 78). Little is known about most of the sculptures mentioned here. Sources on Greenough and Stephenson reveal nothing about the works by them as named here and, in Greenough’s case, the attribution is suspect: neither a work by that title nor anything by Greenough that might fit that title are known. Interestingly, all four of these sculptures were discussed by Hannah Lee in her art-historical Familiar Sketches, again suggesting that it was through Lee that Julia Bryant acquired the sculptures. Sarah Cushing Paine, Paine Ancestry (Boston: David Clapp & Son, 1912), 267. Her parents had already lent the painting to the Athenæum in 1835 and 1850. Perkins and Gavin, 11. In 1823, a John Bryant, probably Julia’s grandfather, donated money for the erection of a lecture room at the Athenæum (Swan, 8-9). John Bryant, Jr., was a Proprietor of the Athenæum in 1844; by 1904, his shares had descended to John Bryant Paine and Charles Jackson Paine, Jr., sons of Julia Bryant Paine (Centenary, 141). Julia Bryant inherited proprietary shares in the Athenæum from her grandmother in 1864; Hannah had received them (no. 662) in 1859 from her brother William Sawyer who had acquired them in 1850 (Athenæum Centenary, 158).